The ILS9.75 platform is designed for laser material processing in a wide variety of production environments. Flexible enough to be installed as a standalone system or integrated into an automated manufacturing line, the ILS9.75 is an excellent choice for no-tool prototype production and is also used in research and development facilities around the world. In addition to a spacious 36" x 24" x 12", 10,368 in3 (914 x 610 x 305mm, 169,901 cm3) material processing envelope, the ILS9.75 incorporates our Pass-Through feature, which allows both side doors to be opened to process material of unlimited length. 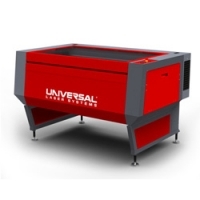 Universal’s ILS and XLS platforms are also the only CO2 laser systems in the world that can be converted between CDRH Class 1 and CDRH Class 4.